Businesses in central Harare appear to have returned to a measure of normalcy following the violent protests that rocked the southern African country last week. But armed soldiers and police maintained a heavy presence in the Zimbabwe capital's business district and suburbs. The protests which erupted over a massive hike in the price of fuel, were met with a brutal crackdown by security officers, which left many businesses counting losses. Confederation of Zimbabwe Retailers president Denford Mutashu has called on the government to create a resuscitation fund to help businesses that had properties destroyed and inventory looted. "We have appealed for a distressed fund; we can call it a restocking facility that members both formal and informal can access," said Mutashu. "Business has indeed returned to normalcy, but we are dealing with the aftermath. Those that were affected - how can they get assistance [...] to be able to resuscitate?" Many are informal players, he added, who lost "literally everything" and are in need of an avenue to restart operations in order to continue contributing to the economy. Employees of affected businesses stand to lose their jobs if their employers fail to restart successfully, Mutashu said. "We also looking on the side of employees. Quite a number have been affected and lost their jobs. We are looking at that butchery, that pharmacy, that bottle store that was destroyed and had goods pillaged." He said the country’s second capital, Bulawayo, was the worst affected with many retail outlets having been looted or damaged. "In the case of Bulawayo, almost everything was ransacked and vandalised, so we are actually going to Bulawayo this Friday, there is going to be a meeting with those affected and then we submit a comprehensive report to our ministry, Ministry of Industry and Commerce and Enterprise Development. "The Ministry has directed we compile a comprehensive report, that government is going to use for further action," Mutashu said. He described the violent protests as a sad chapter than should never be allowed to happen again. A manager at a Pick 'n Pay store in Harare, who asked not to be named, said they had recorded brisk business since Monday. "I think it’s to do with the fact that most people had run out of food, or are restocking just in case something like what happened is repeated, so business has been good," the manager said. While clothing retailers had also resumed operations, business was not as brisk as what grocery retailers were experiencing. 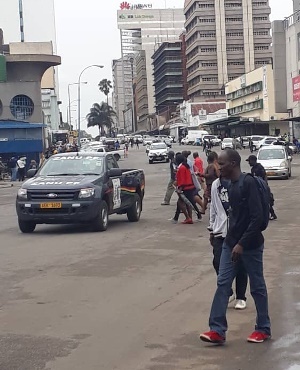 A shop assistant in an Edgars Stores along Jason Moyo Avenue, in Harare CBD, said although they had opened and not seen any unusual incidences, business was very quiet. "It’s quiet, very quiet. I think consumers are squeezed, following the fuel price hikes a week or so ago. Disposable incomes are under pressure. People have no spending power, so it’s very quiet,” said the shop assistant. As the AFP previously reported, a collection of Zimbabwe human rights groups have said that at least 12 people have been killed since the 150% rise in fuel prices, and hundreds arrested. Zimbabwean President Emmerson Mnangagwa cut short a visit to drum up foreign investment to return to Zimbabwe over the weekend.